I’m sure you would agree that world without art is boring but could it change the world? JR, an artist from France tried to answer this question. The result of it – a massive international photography project called Inside Out. Talking more about Inside Out, it is a perfect way to show what you stand up for. It is a great way to tell a story or message of yours. What you do here is you send a portrait of your idea and they send you back a huge copy of that. Then you are able to paste the copy in your community to let everyone see what you stand up for. The project began in 2011 but it’s still up and open to everyone. To make things clearer let’s go a few years back. 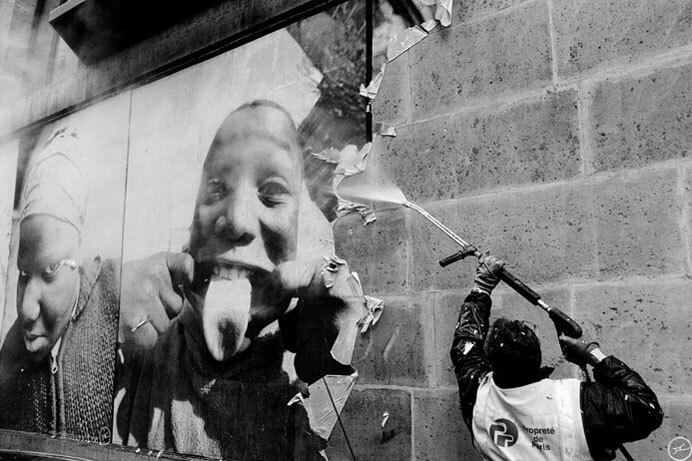 JR was just a photographer, freely exhibiting in the streets. He loved street art – and so his audience did. It happened so that he found a camera in the subway of Paris. He then did a tour of European Street Art and took photos of various creations of people in the streets. The photographer started tracking the people who communicate messages via the walls. Underground wasn’t everything – he visited lots of forbidden roofs of buildings in Paris and just watched the people passing. 2006,One of the first JR’s known works is Portrait of Generation. The artist simply just took photos of various provincial ‘thugs’ and pasted it in large formats in the bourgeois part of the city. At first the project was illegal but later it became official as it was accepted by the Paris City Hall. It showed that not the origin or your bank account describes who you are. In 2007 comes another work he does with Marco called Face 2 Face. It was probably the most illegal exhibition ever. The artist took photos of various Palestinians and Israelis and faced one with each other again in huge portraits on the streets. He did it in eight Palestinian cities and more incredibly – on both sides of the security wall separating Israel and Palestina. It was considered impossible to do so as of the conflift between these two areas but JR did it. Most of the passengers were not able to say which one in the photo is a Palestinian and which one is a Israeli. To sum up, it shows that you shouldn’t be judged for where you are from. In 2008 JR started another project called Women Are Heroes. He pasted portraits of local women on the walls in the streets. The artist wanted to underline the dignity of women as they are often abused in those lands. In 2010 he even presented a film of the same name. Later in the same year JR began The Wrinkles of the City. He sized portraits of elder people as the cities he pasted in have experienced changes in history. Cities like Cartagena, Shanghai and Los Angeles. The photographer’s idea was to bright to light the memories and history of cities before the change.